How to Pick the Best Toys for Bulldogs in 2019? » How to Pick the Best Toys for Bulldogs in 2019? Bulldogs are a playful, calm, and kind dog breed. They make great indoor dogs and companions, because they love to be around their families. Bulldogs are less energetic than other dog breeds, but regular exercise in small spurts is still important to manage their weight. So how do they play? Bulldogs, a.k.a. British or English Bulldogs, are known for having a compact but solid build, wide face, and short legs. Their ears are small compared to the rest of their body, and they have thick folds of skin around their face and head. 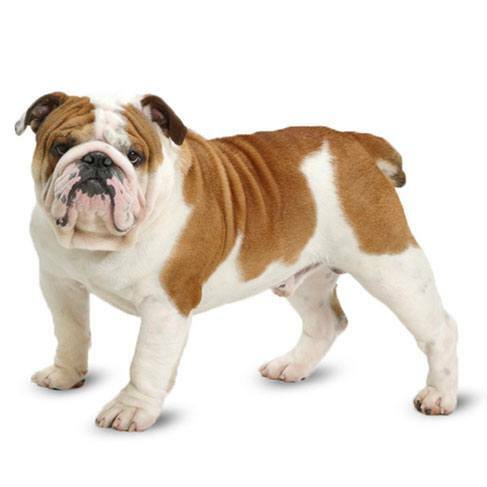 Bulldogs’ coats are short and smooth, with coloring that can vary between white, red, and fawn. In the past, Bulldogs were used for the banned sport of bull baiting until people started keeping them as their loyal companions. Bulldogs are generally patient and gentle with children, but they can be territorial when it comes to their homes and families. As a brachycephalic breed, it's important that they are monitored carefully for heavy or noisy breathing during playtime in extreme hot temperatures as this can lead to a heat stroke. Supervise your Bulldog since they can struggle in hot weather. How does the Bulldog like to Play? Compared to other medium sized dog breeds, the Bulldog doesn’t require quite as much exercise. Leisurely morning or evening walks are best for the Bulldog, who tends to overheat. Owners should be careful not to keep them outside on warm or humid days, since the breed tends to suffer from ﻿﻿﻿breathing problems. The solution? 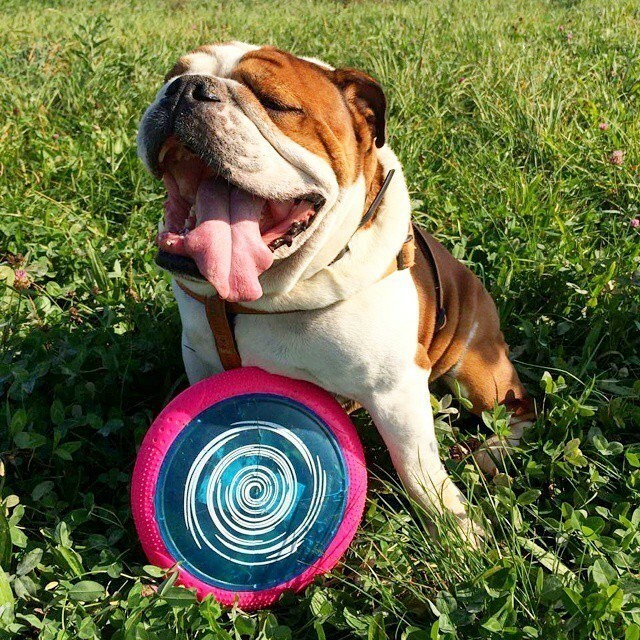 Owners should play with their Bulldogs in an air-conditioned house or apartment on these days instead! Bulldogs are known for getting fixated on things that have their attention. If something catches their interest on a walk, it may be difficult to pull them away from it. Rewards-based training using small treats can help improve the stubbornness sometimes seen in Bulldogs. Unlike many dog breeds, Bulldogs don’t require a lot of exercise to stay healthy. They should be taken on daily walks to maintain their weight, but should never be pushed past their limits. Use their favorite snack food or toy and instruct them to sit and wait in one spot while you hide the treats. Release them and gently encourage them to find the treats. Finally remember to reward them through either praise or tossing the toy around a few times. 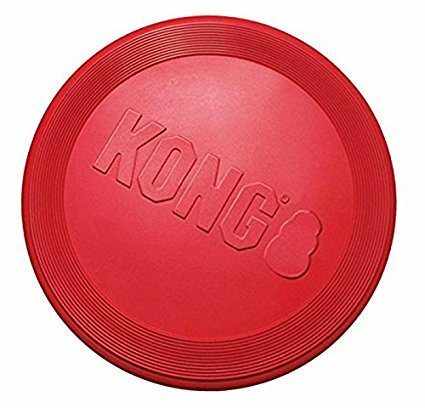 A classic favorite and a great way for your Bulldog to meet all its exercise requirements without having you run out of breath yourself! Just ensure that you have the right fetch dog toy so as to avoid injury to mouth or getting stuck in its throat. Try and stay away from sticks or stones or even small balls as these can be damaging to their jaw and may even block their airway. During hot days keep fetch games short and ensure you have plenty of water available for them . Another way to keep a Bulldog active throughout the day without overworking them is by taking them to run errands or to visit friends. They will enjoy being around their family during the day, and this gives the Bulldog the opportunity to socialize with other people and pets at the same time. 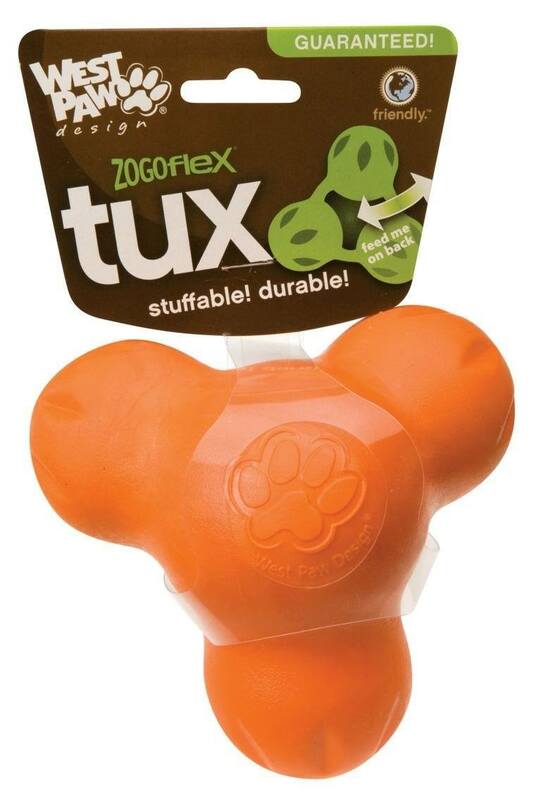 For a powerful chewer with strong jaws toys like West Paw Design’s Zogoflex Tux are great toys for Bulldogs because they are built to be durable (if they break the company will replace them) and they are recyclable! These versatile toys are dishwasher safe, they float, bounce, and can even withstand heavy chewing sessions. Overall an excellent choice of toy for your Bulldog which will keep him busy for endless hours. Bulldogs love to be with their families, but if for any reason owners need to leave them alone for short periods of time, comfort toys can help them deal with separation anxiety. 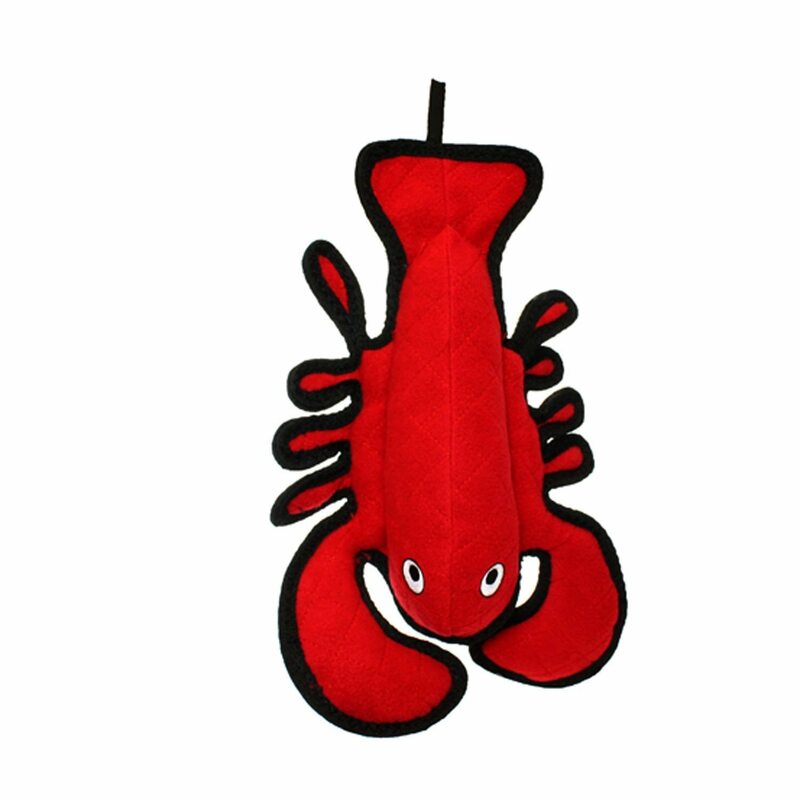 One great soft yet incredibly durable and tough toy for bigger dogs is Tuffy's Lobster Dog Toy﻿. This toy is made with material used for industrial grade luggage and a has soft layer of fleece on the outside, making it the perfect tough soft toy for Bulldogs. It's machine washable, it floats, it's Vet approved and recommended and it even floats! A great toy for your arsenal! Small Balls: When choosing toys for a Bulldog, owners should avoid buying small balls and toys that their dog could potentially choke on. Cheap Toys: Since Bulldogs can be avid chewers, owners should buy toys that their Bulldog won’t be able to easily chew through since some toys have small parts inside that dogs can choke on or harmful fillers that the dog can ingest. Bulldogs are known for their distinctive faces and cute, lovable demeanors. Unlike most dog breeds, Bulldogs require minimal exercise and shouldn’t be pushed too hard. They do need some physical activity to stay in shape though, and toys to keep them happy and preoccupied. Owners should try to find dog toys that will withstand a Bulldog’s strength for optimal playtime.